#hangsheadinshame, read all about the before here. Can you even believe that is the same room?! The paint color (Gratitude) really brightened the room up. Adding a bit of Metrie trim work and paint from Voice of Color turned my nightmare furniture into a dream! 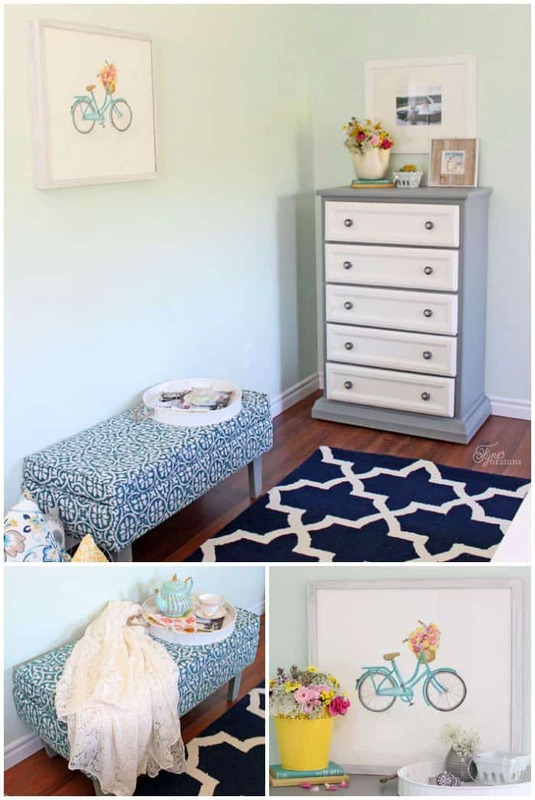 Read the tutorial how I updated the bed and dresser. Warning- when you see how easy it was, you’ll want to cut yours up too. The hand painted wood sign I made is the first thing you notice when you walk into the room. 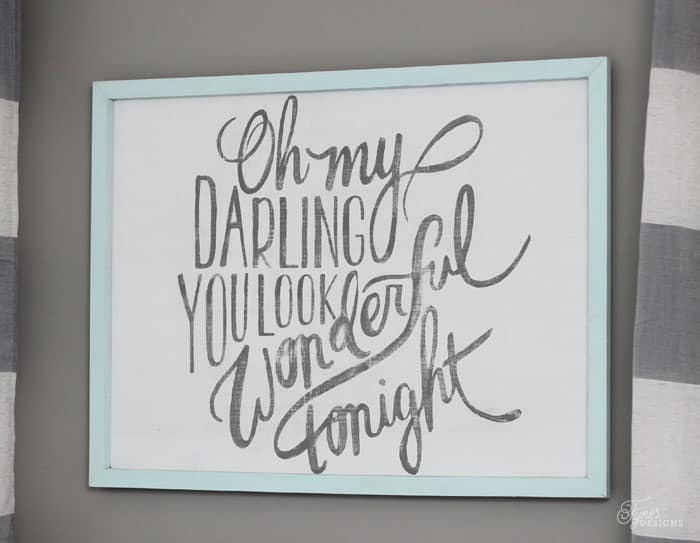 This Eric Clapton number was our wedding song, it seemed so fitting to incorporate it into a space just for us. I can’t stop whistling the tune. I sewed the throw pillows myself, adding contrasting piping to give it a little extra pop. 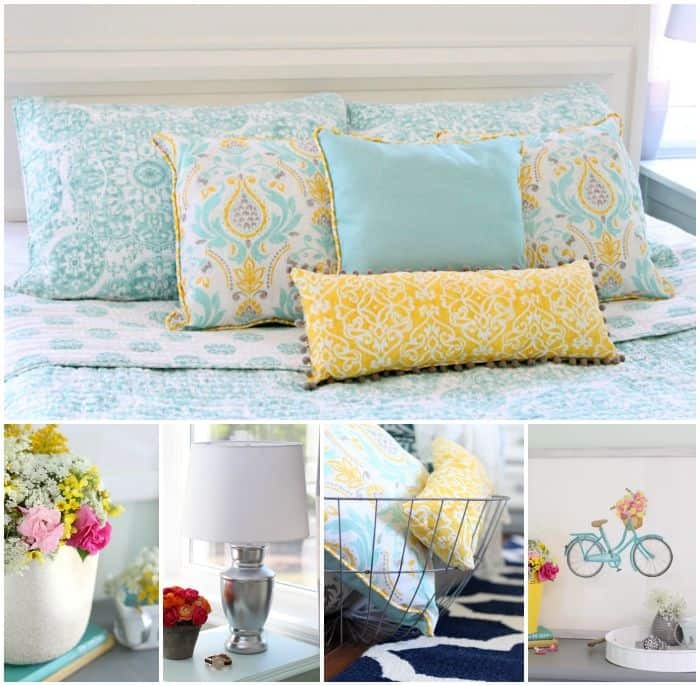 The yellow and aqua fabric set the tone for the whole space, so bright and happy! Adding an area rug (Homespun Trellis Rug in Navy) cozied up the space and gave a nice contrast to the other bright colors. You can read tips about buying an area rug here. At the foot of the bed I made this small upholstered bench, tutorial to follow. 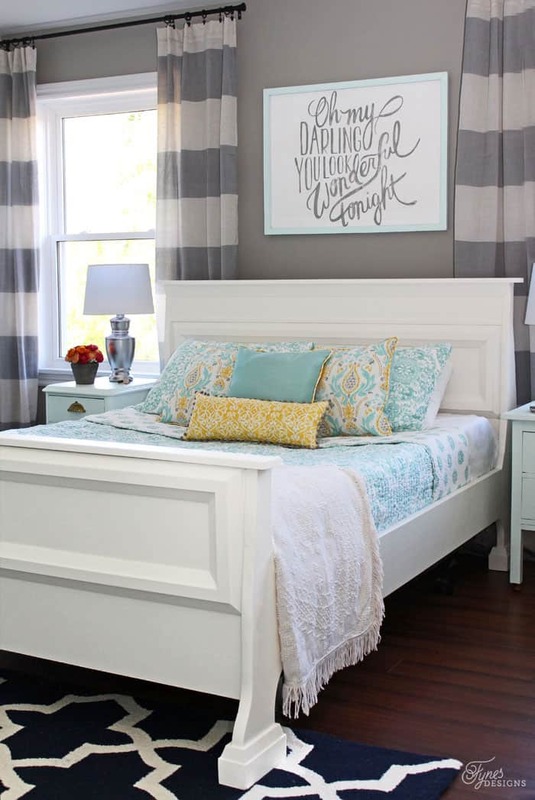 I liked the trim work detail on the footboard so much I didn’t want to cover it up. Instead I pushed it against the wall and it makes a great divide. I used indoor/ outdoor Sunbrella fabric so if I choose to move it to another area it should withstand heavier traffic. We have to talk nightstands… I’m really trying to embrace the mismatched look. Typically I’m strictly a symmetrical gal, but with having the closet door right at the edge of the bed a smaller night stand is necessary to get the door fully open. Plus I needed something that wouldn’t cover the register when we’re back to needing a fire. You may recognize this nightstand, it used to be a dresser that was in my dining room. I cut the drawer off, and replaced the top. 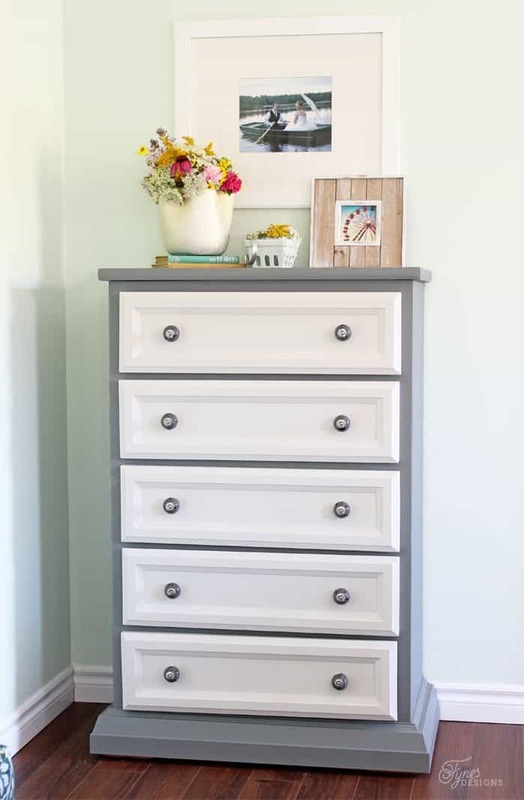 It needed a little extra height, the knobs from the pine dresser worked perfect! 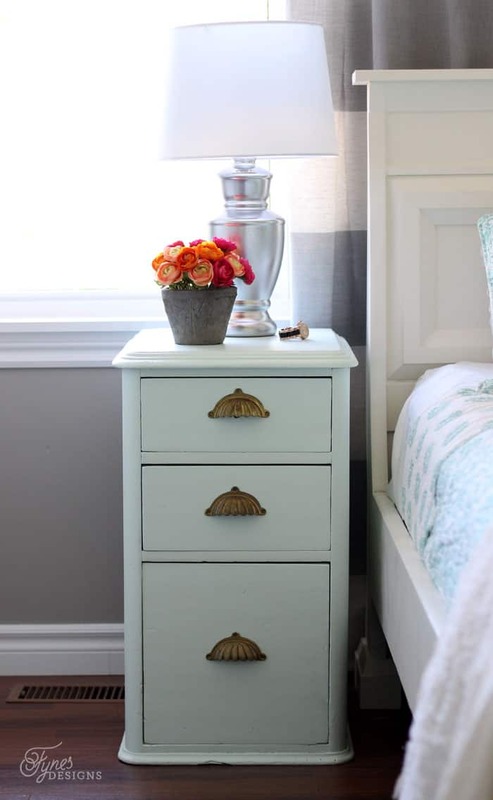 I painted the nightstands with Sweet Pea 105-2 for Voice of Color, so fresh and crisp. Since moving in I wanted a full length mirror, enough standing on the edge of the bathtub to see my outfit. 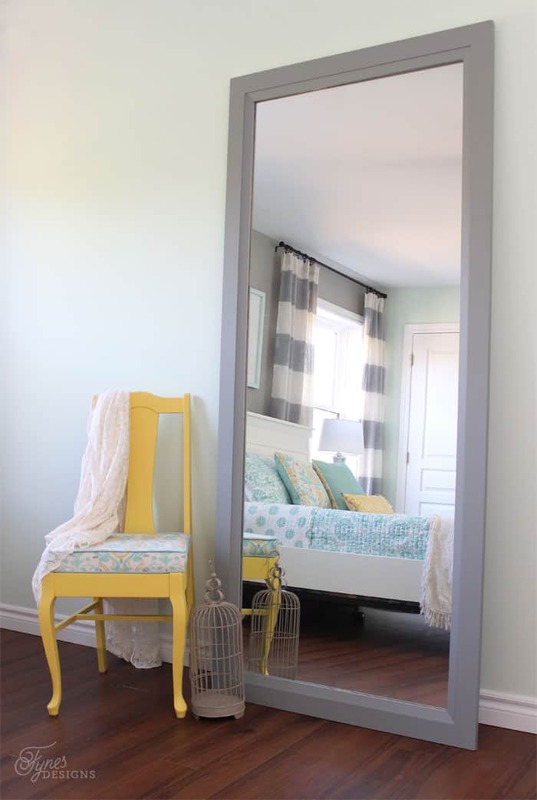 When getting Metrie trim for the bed I got enough extra to build this mirror, I love that it coordinates with the bed and dresser. P.S. don’t order a sheet of mirror over the phone without actually measuring or building the frame first, it might just wind up to be gargantuan. Apparently I’m not great at visualizing size! 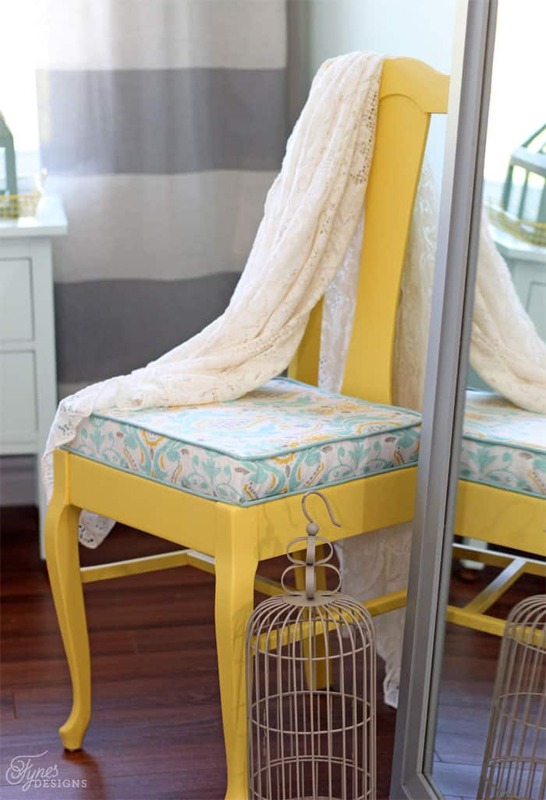 This thrift shop rescue chair in Forsythia Blossom yellow is the perfect pop of color. Doesn’t the furniture look like a pricy set, I’m so thrilled how it turned out. Such a budget friendly makeover! I went a bit heavy on the paint colors in this space, I used the first two Gratitude and Hot Stone as wall colors and the other brighter hues to accessorize. Paint was without a doubt my favourite part of this room makeover. I wanted to design a space that was fresh, bright and colourful but not too feminine; we wouldn’t want to make Mr. Fynes cringe the second his eyes opened in the morning. If you liked this project you may want to check out these other Home Decor Projects. Thanks so much for visiting, I hope you’re inspired to get painting! I can’t even pick a favorite part!! It looks amazing (and I love, love, love the wall art!). It looks absolutely incredible Virginia! I love the mix of colours and pattern that you used. Seriously gorgeous!! Thanks so much Krista, that means a lot coming from you, I love your style! I want you to decorate my house! This is absolutely beautiful and so peaceful. Up to this point I have only used beige and brown in my house for a calming feel, but I’m thinking of switching now that I’ve seen what you’ve done! Thanks Claudine, Go for some color, you’ll love it! Awesomemakeover…like a breath of fresh air! I need you at my house! ? Virginia – It’s STUNNING! I love the colours. It’s come together beautifully. wow everything looks so beautiful together! i really love the rug! Oh my WORD this is fantastic!! I love every single thing. Pinned! Wow, what a beautiful bedroom. 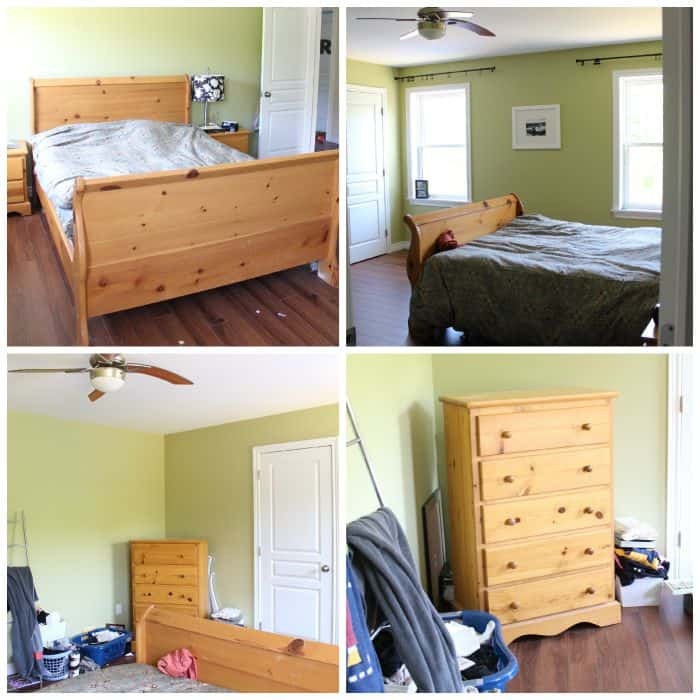 I’m planning on a bedroom makeover this fall, your room has totally sparked my creativity. Gorgeous. I particularly love the lush throw pillows. You did a beautiful job on sewing them! Thanks Susan! I love adding piping to things, I’m a bit addicted! Ha ha, I always love when you visit Lynne! Hope you’re having a great summer! Wow! You’ve done a lovely job Virginia, it’s beautiful!! I love your colours, they all go so very well together with the white furniture. Your details are amazing and that gorgeous sign you made – oh my! Everything looks so fresh and pretty. I bet you’re getting a good night’s rest now! For sure! We spent a few nights in the middle of the room on a mattress on the floor, ha! The colours are very calming. Love the rug and the artwork! But honestly, the floor length mirror idea is perfect- can you tutorial that so I can make my own? I’m in desperate need! It all looks so good, it’s so bright and just awesome. Oh my, I looove it! Colors are amazing! Love the sheets. And look at the vintage telephone- awesome! Wow! That turned out so pretty!!! I love the colors you used! Great job! I am so thankful I ran across this post. 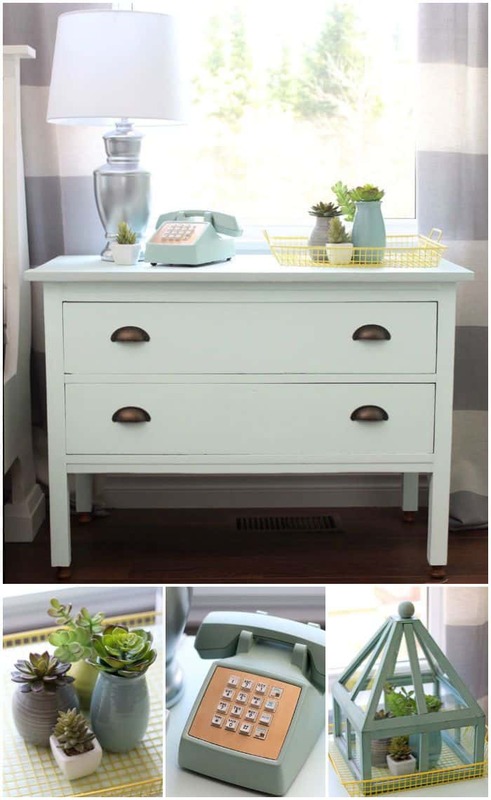 I have been looking for a good mint green to paint a small hutch. 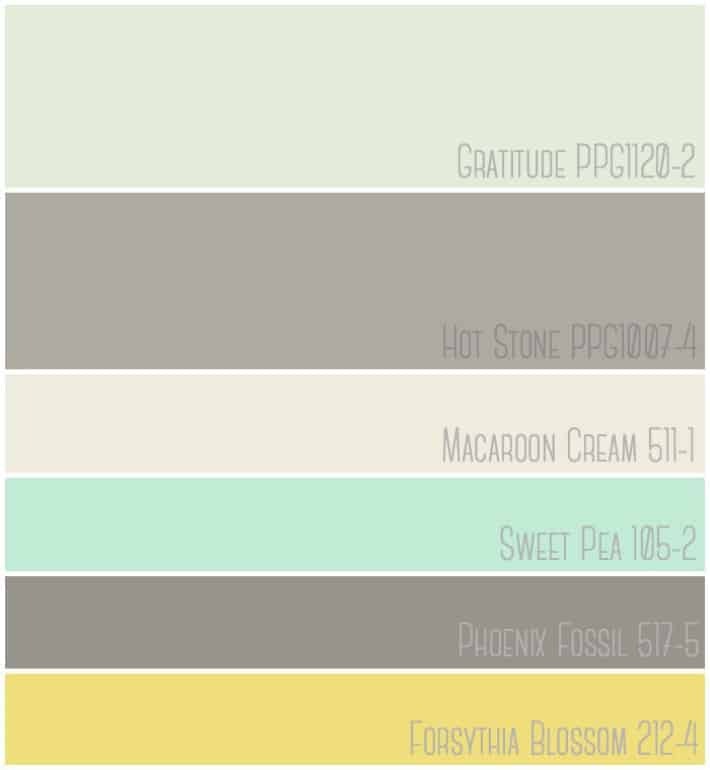 I really like the sweet pea color you have listed in your color palette. I’m pinning for future inspiration! Its one of my new favourites!! GORgeous! I’m in love with the big sign and the colors you used and those curtains…that’s it, I’m moving in! Absolutely gorgeous! Love the paint colors! That looks absolutely amazing!!! I am really loving that yellow chair 🙂 Great job! Hmm..ok!! Maybe I will give it a shot. I like that its low cost! Thanks for the reply. I love all the patterns and colours you have used in this room, simply stunning! Love it and sharing it on our weekend features post on Sunday! The colors are so gorgeous! It all came together so beautifully! What a transformation from the “before”! Pinned it! Your room looks fabulous! I really like that light mint color that you chose for your walls, it looks really crisp and clean. What a gorgeous transformation. 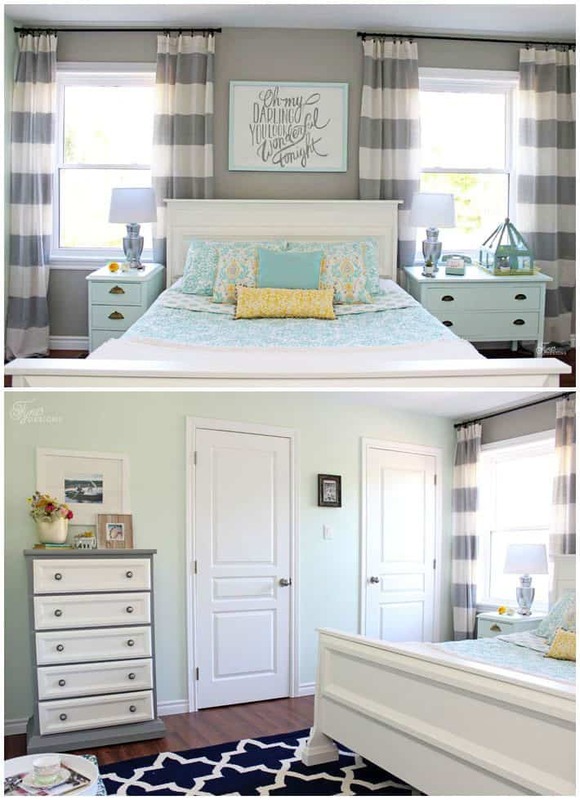 I’m inspired to do a bedroom makeover in my house! Thank you for sharing on #HomeMattersParty! I think the gave me bedroom fever! I’m on to the kiddos rooms now! I love what you did in the bedroom. It’s such a bright and happy space. Love the colors you chose. And that sign above the bed is so amazing. Great job! Wow, what a beautiful bedroom! I love all the details and how bright the room looks! Thanks for linking up to Pretty Pintastic Party, where every post gets pinned! What an amazing transformation! You should be very proud of yourself. I love the colors, the furniture, the artwork…all of it! 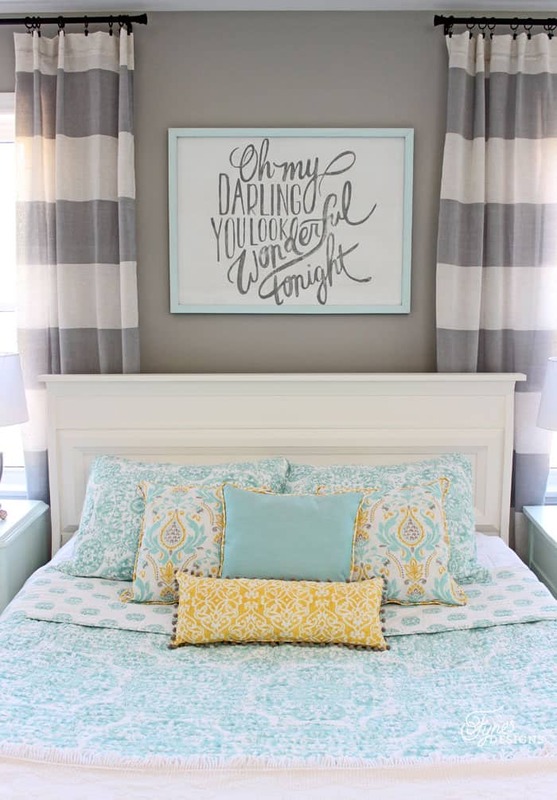 I love everything about this room – the gray and white color palette is so soothing and tranquil, and the aqua and yellow bedding is truly fitting. Love aqua! I could move right into this room – you could have chosen this just for me. Also love, love, love the signage over the bed! How romantic! I’ll be singing that tune all day now…………. Absolutely LOVE this makeover!! You did so great! Thank you for linking up with Weekend Wind Down Link Party, you are one of our features for tomorrow! Come check it out and link up more of your awesome stuff! Wow! What a beautiful transformation. Love the colors and the way you styled everything. Wow….I am speechless Virginia! You have made our mouldings look incredible! I look forward to future projects, to see how you transform our other Collections. Thanks so much for visiting Cindy! I can’t wait to work on my next project with Metrie too! It looks great! I’m wondering tho, where did you get the curtains from?? I’m currently looking for the prefect gray/white striped curtains. I actually go them at Home Sence, which is like Home Goods in the US, just a lucky find! Please, tell me where you got the quilt set. I need this…. ? I love your makeover! I’m moving in our small country cottage next week and would love it for our master bedroom as well.